Eaton has released several free hardware and software tools to help specify its variable speed drives and work out how much energy they will save in a particular application. The tools include a slide-rule format selector tool that helps to choose VSDs, along with correctly co-ordinated ancillary components such as mains protection circuit-breakers, contactors and sine-wave filters, as well as optional mains and motor chokes. To use the tool (above), users simply slide an inner section until the required supply voltage and motor rating can be seen through windows in an outer section. They can then read off the most suitable drive from Eaton’s PowerXL DC1 and DA1 ranges, along with information about compatible components for the drive circuit. The tool is double-sided, with one side providing information about single-phase drives with power ratings from 0.37–4kW for use on 230V supplies, while the other side covers three-phase drives with power ratings from 0.75–160kW for use on 400V supplies. The sliding section can also be reversed so that the three-phase side shows data for three-phase drives with power ratings from 0.37–75kW for use on 230V supplies. Parts numbers are provided for the drive and the ancillary components, along with the frame size of the recommended drive, its rated operating current up to 50ºC, and the appropriate fuse rating for applications where fuse protection is preferred to circuit-breakers. 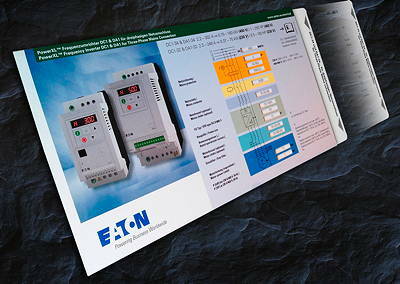 As an alternative to the selector tool, Eaton offers an on-line configurator that allows users to enter details of an application and provides them with details of suitable products. Eaton’s second development is a software package that allows fan and pump users to calculate how much they could save on their energy costs and carbon emissions by fitting variable speed drives. The Energy Savings Estimator software, which produces detailed reports suitable for use in business case proposals, is available as a free download. The software works on a project basis – ranging from a single fan or pump, to a whole plant with multiple fans and pumps in any combination. Users are guided through a five-stage process that leads to the production of a detailed energy-saving report. All data entered can be stored for later recall and, if necessary, modification. It can also be used as the basis for new projects. The first stage of the calculation involves entering project and site information. The second stage allows the user to enter utility costs, while the third defines the project, including information on the pumps or fans and the type of flow control already in use, if any. Motor ratings, efficiencies and operating hours can be entered and the duty cycle can be viewed in graphical or numerical formats. You can also enter the VSD price, the cost of fitting it and the value of any incentives available for enhancing energy efficiency. The fourth stage calculates and displays the estimated energy savings in kWh and cost terms, together with the projected reduction in CO2 emissions. An estimated payback period for the project is also given, with an option to show a graph of payback-versus-time. The fifth and final stage presents the project data and the results as a detailed report that can be viewed, printed and exported in various file formats.